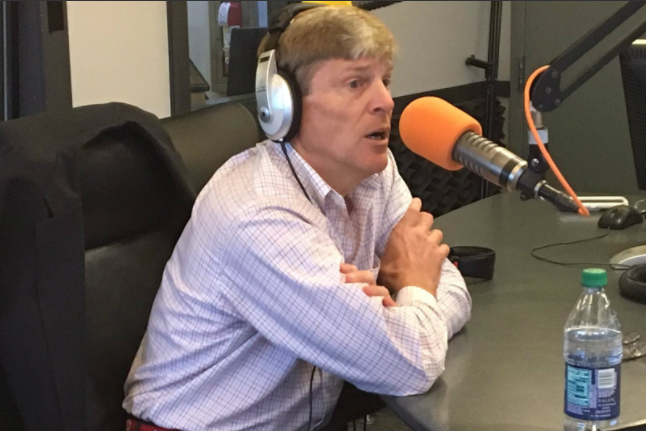 Phillies ownership partner John Middleton joined SportsRadio 94-WIP for an expansive interview Thursday morning when he talked about wanting one of his teams to be considered among the best in baseball history someday. NEW YORK – For years (decades?) the Phillies ownership partners worked quietly in the background, rarely to be heard from let alone seen. Apparently, John S. Middleton, who has a 48 percent ownership stake in the Phillies, doesn’t operate that way. We saw this two years ago when he took over a press conference at Citizens Bank Park when Andy MacPhail was hired as the new team president. Middleton was emotional and passionate that afternoon. He showed off those same personality traits this morning in an expansive, hour-long interview with (PhillyVoice contributor) Angelo Cataldi on SportsRadio 94-WIP. You can listen to the whole interview by clicking on the link embedded in the following tweet. Middleton: "Losing is always hard, but particularly coming from the position that I thought we were going to win. I was devastated, I was really emotionally upset. I went into the locker room because I wanted to talk with every player, because I wanted to let them know how much I appreciated what they did, but I also wanted to get them mentally and emotionally focused on the offseason and 2010 because I thought we had some years ahead of us. One of the important parts about losing is learning how to be resilient and come back from it. I wanted to try to do what I could do to get them focused on coming back from that really devastating loss. But it’s hard to have a private conversation when there’s, you know, a couple dozen media people in the locker room. I happened to look over and for whatever reason, maybe because he had a really tough series, Ryan (Howard) was by himself. So I kind of walked over to Ryan, I kneeled down next to him, and we started talking, and it became more and more emotional. And I said what I said. I said, 'Ryan, I want my blank trophy back.' Somehow it got picked up. … It’s funny, when we had the ceremony for Howard last year for the last game, when I hugged him, I whispered in his ear, I said, 'Ryan, I’m still ticked off we don’t have our bleeping trophy back.' If you see the video of it, he laughed, kind of chuckled and smiled. "I don’t know know how many people you have listening right now, but this is a message for them: I’m intent on winning. I mean, we’re going to get that trophy back somehow, or I’m going to die trying. That’s how it’s going to be. ... The most important reason for professional sports teams exist is to win. If you’re not aiming to win, then you really don’t belong owning a sports team in my opinion." "When people ask, what are the greatest teams in the history of baseball, I want one of our Phillies teams to be in that conversation. I don’t think you can ever say, ‘This is the best team, and every other team is not the best.’ But I think there’s always going to be a handful, and maybe a couple hundred years from now, a couple of handfuls of teams that people will look at. If you say the ’27 Yankees, nobody would say you’re silly. If you said the ’29 A’s, nobody would say you’re silly. You can talk about the Big Red Machine, talk about the Yankees teams in the late 90s among the greatest teams. And somewhere in there, I’d like us to be in that conversation. … Why not try? Someone is going to be in that conversation right, Angelo? So tell me why we shouldn’t be doing it? What’s the logical reason to say, 'I don’t even want to think about that opportunity, it’s beyond my ability?' Listen, if I feel that way, I need to get out of the business." "I love the comparison. Looking back, I would love to have as many rings as George does. He was a committed person to winning. And I’m as obsessed with winning as he (was), I hope I can be as successful at winning as he was." "Yes and no. I want to win and I want to win yesterday. I want to have things fixed yesterday. But you have to understand and you have to be smart enough to know that you have to be disciplined enough to know, which is one of the things I learned wrestling (in high school), that you have to be disciplined enough to set goals and work toward them and it takes time. So I’m patient as long as you have a plan, and it’s not that your plan starts here and you’re, whatever, 4 or 5 or 6 years here. It has to be, here’s where you are in Year 1, here’s where you’ve got to be in Year 2, and as long as I’m on track and on schedule, and I believe we are, and Andy and Matt do as well, I can be patient. But I need to see that progress. If I don’t see that progress then I get very impatient very quickly." "As analytical as Matt (Klentak) is, he looked at this issue last summer at one of our meetings, I think it was last August specifically, and he presented his findings. He looked at the last six teams that had gone through successful rebuilds: the Cubs, the Mets, the Orioles, the Pirates, Astros, Royals. And what you find in there is that the shortest amount of time of a rebuild, that is to say from a losing season to being a playoff team, is four years. The Cubs did that. The Royals I think were 7 years to get to a winning season and 8 years to get into the postseason. So that kind of gives you the bracket, 4 to 7 years, and we really didn’t start our rebuild until after the 2014 season. … But we’re in Year Three and I think we’re on track, and I'd like to think we’re on the shorter end of that spectrum, 4-5 years rather than the longer end, 6-7 years." "Matt and his front office are going to come to us when the time is right. And listen, it’s not just free agents, it’s trades, too. You have to remember, we traded for (Roy Halladay), we traded for Brad Lidge. You go back, we traded for Steve Carlton, we traded for Garry Maddox. These were trades that we made to bolster (the team) and by taking on really good players you’re taking on larger salaries, so there’s a salary commitment there. So the strategy obviously is if you're building from within through the farm system, and that’s the way you have to do it in this industry, you’re going to have younger players that are less expensive for a while and just as they did in ’06, ’07 and ’08, those younger players who are good, and we’re going to have some good players like that, you have to sign them, they get into arbitration-eligible years and their salaries go up, you get into free agency, their salaries go up even more. And we have the ability to sign those players. We have the ability to trade for those pieces. Whatever we can’t develop internally, and nobody develops everything internally, you have to be able to trade and sign free agents. And we have the money to do it." "Look, we had the Number two, three or four payroll for years in all of baseball, for four or five years, we were second, third or fourth. We’re going be there again. Philadelphia is a big market. We’re going to operate the team like it’s a big market. We’ve got a very good contract with Comcast for our local TV. We’re going to be aggressive when it’s appropriate to be aggressive." "There are certain days in your life, the day you get married, the day you have kids, the day your kids get married, and we’re not there yet, but I’m told the day you have grandchildren, those are extraordinary special unique days. Take all of those days and put them aside. They are what they are and nothing can touch those moments in your life. Put those aside, and look at all the other days in your life, the day you win the World Series is the best day in your life. "When we rounded the corner on those (parade) floats and saw the sea of red, and it was literally a sea of red, and you go down Broad Street and it wasn’t just on Broad Street, but people were packing down the side streets. People hanging out of windows and balconies and rooftops. It was the most unbelievable feeling. And Philadelphia deserves to have that again. And we aim to give it to them."